Western Sydney’s Tai Tuivasa has already made quite a name for himself in the UFC. The Australian knockout artist, nicknamed “Bam Bam,” sports an unblemished record and has been labeled one of the organization’s next big prospects in the heavyweight division. Displaying solid technique, knockout power, and the prowess and swagger of a seasoned veteran, there is no doubt that the proud young man from ‘The Area’ has a bright and successful future in front of him. Some, however, do not know that “Bam Bam” has already lived another life as a very talented professional rugby player, and that interestingly enough, re-directing his focus from a career in rugby to a career in fighting ultimately saved his life. And that is where Tai Tuivasa’s story begins. Before embarking on his MMA career, Tai Tuivasa was a successful and talented rugby player for the Sydney Roosters. Starting as a child and playing all through his school years, Tai showed his natural talents and honed his skills, which ultimately got him signed with the Roosters in 2010. However, his real dream, at the time, was to sign with the local team in his hometown of Western Sydney, the Penrith Panthers. “I’m from ‘The Area’ in Western Sydney, but the Panthers didn’t pick me – I think they hated me,” an interview with The Daily Telegraph in an article about his rugby career. Tuivasa wanted to represent Western Sydney but settled for a position with the Roosters. In addition to that struggle, Tuivasa also talked about the increase in demands from rugby organizations, of its players, as another killjoy in his career. After a few years, Tuivasa started to realize that his heart just wasn’t in it anymore. He began to lose the passion he once had for the sport. However, the final straw for Tuivasa was one fateful night at a casino, where a gambling addiction he adopted, finally did him in. In an interview with The Daily Telegraph, he was asked why he quit the Roosters. “Because the night before, I did my arse at the Star Casino.” And lost his arse he did. So he did, but not without leaving an impression. Two years after deciding to walk away, rugby recruiter Peter O’Sullivan had this to say about Tuivasa: “And I still do not doubt that Tai’s an NRL player. The kid is incredibly athletic, skillful and has a footy brain.” That same athleticism and skill have, no doubt, been a fundamental asset in Tuivasa’s fighting success. Tai Tuivasa’s decision to “switch gears” from rugby to fighting wasn’t just some half-assed decision. His goal of making it in fighting – to make it to the UFC, was something that was always there in his mind. “I would never have just given up on rugby league if there wasn’t something else in place or if I didn’t believe in my ability as a fighter. I’m not that stupid.” Tuivasa says. The casino incident was the “tipping point,” as he refers to it, for turning the idea of fighting into reality. Before he inevitably walked away from rugby, Tuivasa already had one fight under his belt, at the tender age of 17. Along with competing in MMA, Tuivasa also competed in boxing and kickboxing, boasting respectable records. As a boxer, he went 5-2, and he managed a 14-2 kickboxing record. However, MMA – and fighting for the UFC – was Tai’s real dream. Between August 2012 and October 2016, he competed five times on the local Australian MMA circuit; winning all of his contests via first round KO/TKO. In his fourth fight, in June 2016, he won the AFC Heavyweight Championship. In October of that same year, he defended his title against MMA veteran and former UFC competitor, James McSweeney. His victory over McSweeney was his calling card to the UFC. However, not all things in life are butterflies and rainbows, especially in the fight world. In his bout against McSweeney, Tuivasa got his knee caught in a tight leg lock, which left him hobbling back to his corner at the end of the first round. Fortunately, McSweeney, who was suffering from blurred vision, couldn’t answer the bell for the start of the second round and withdrew from the fight. Tuivasa’s right knee, however, turned out to be severely damaged. “I snapped two ligaments and snapped the tendon,” Tuivasa shared. 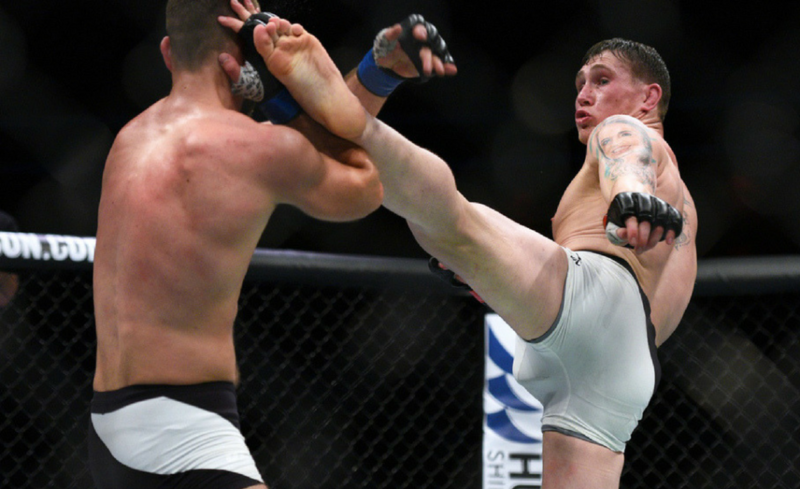 The damage to his knee required him to have surgery; leaving him sidelined for a year and postponing his UFC debut. After the unfortunate circumstances stemming from the McSweeney fight, Tuivasa followed all the necessary steps in nursing his knee back to health. Moreover, he was rewarded with incredible luck. One year after his knee surgery, the UFC made its way to Sydney, Australia, his hometown, for UFC Fight Night 121: Werdum vs. Tybura. By this time, Tuivasa’s knee was back to 100%, and he was finally able to make his UFC debut and compete on the big stage in front of his hometown crowd. The stars aligned and, under the bright lights, “Bam Bam” showed the world why he belonged there. 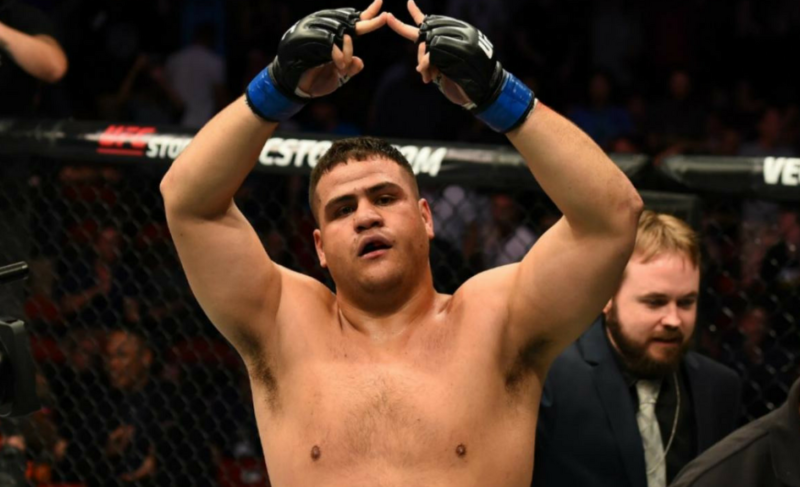 On November 19, 2017, Tai Tuivasa finally made his long-awaited, highly anticipated UFC debut. He was pitted against tough, North Carolina striker, Rashad “The Daywalker” Coulter, who was sporting an 8-2 record. As the round started, Tuivasa came out loose, like he had been there 1,000 times before, and showed to be the more effective striker. A miscalculated throw resulted in Tai ending up on his back, with Coulter on top of him. However, the fight didn’t stay there long. Tuivasa was able to hip escape and get back to his feet. Tuivasa went back to work and began setting up big strikes. 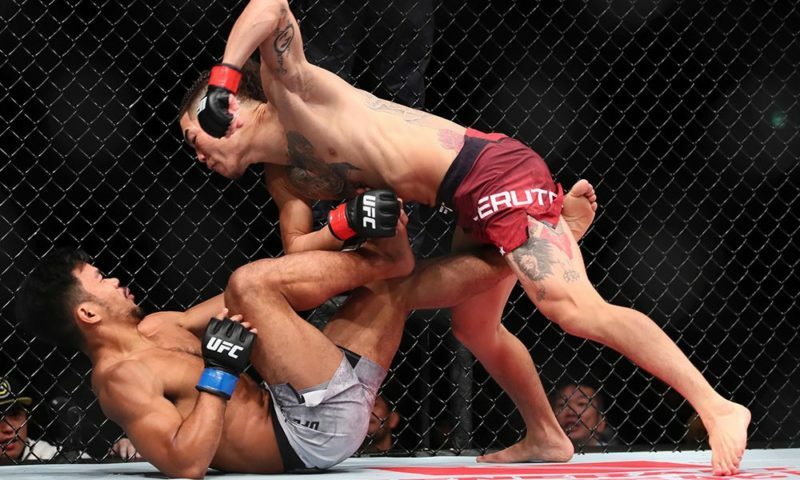 With less than a minute left, Tuivasa landed a strong outside leg kick, sweeping Coulter’s leg out from underneath him and sending him to the mat. As Coulter clamored to get back to his feet, Tuivasa stalked him to the cage. It was there that Tuivasa demonstrated some of his star athleticism. In one fluid motion, Tuivasa launched all 265 lbs of himself through the air and crushed Coulter’s chin with a massive flying knee. The impact and precision sent him crumpling to the mat as if a sniper just nailed him with a clean headshot. The hometown crowd roared in support of their fighter and Tai couldn’t be happier. He kept his undefeated record, and his streak of first-round knockouts active and did so at the place he calls home. To top it all off, Tuivasa won the “Performance of the Night” award, which comes with a $50,000 bonus. Not bad for a first impression. 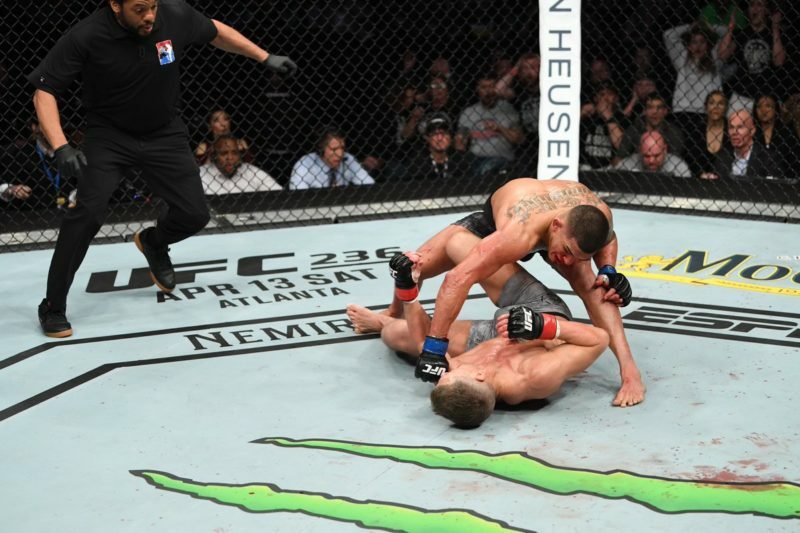 Three months later, on February 11, 2018, the UFC came back to Australia for UFC 221 in Perth. Tuivasa was able to secure an opponent for the fight card and, again, have the privilege of competing in his homeland. His opponent was Cyril “Silverback” Asker; a well-versed and tough French fighter with a 9-3 record. The ‘feeling out’ process was virtually nonexistent. Both men came out looking to land heavy strikes. One minute into the fight, Tuivasa landed a clean elbow counter that sent Asker reeling back. Seeing that he was hurt, Tuivasa closed in on Asker; not letting his opponent off the hook. His violence on Asker was calculated and destructive, mixing up punches to the head and body, as well as more elbows to the Frenchman’s cranium. The multitude of strong elbows thrown and landed by Tuivasa, opened up a gash near Asker’s left eye. It was there that “Bam Bam” quite literally “smelled the blood in the water,” as he went for the finish. One final hellacious elbow from Tuivasa smashed against Asker’s temple and sent the Frenchman stumbling along the cage where he would fall face first to the mat. That was all the referee needed to see, and the fight was stopped. Now 7-0 (2-0 in the UFC), with all of his fights ending in the first round, Tuivasa’s fan base began to grow; and so did his desire to break into the top 10 on his journey to become champion. One of the first things you can notice about Tuivasa is his demeanor and body language – relaxed, loose, almost nonchalant. Of course, this comes as no surprise, seeing as he has been one of Mark Hunt’s main sparring partners for over seven years now. 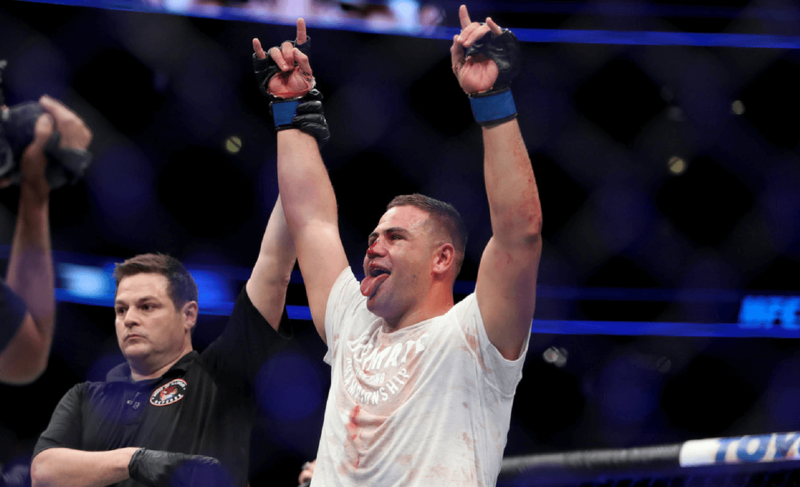 “When I was fresh 18, my trainers asked me: ‘Do you want to go spar Mark Hunt; we’ll fly you out to New Zealand,” Tuivasa stated when talking about his start and connection to Mark Hunt. 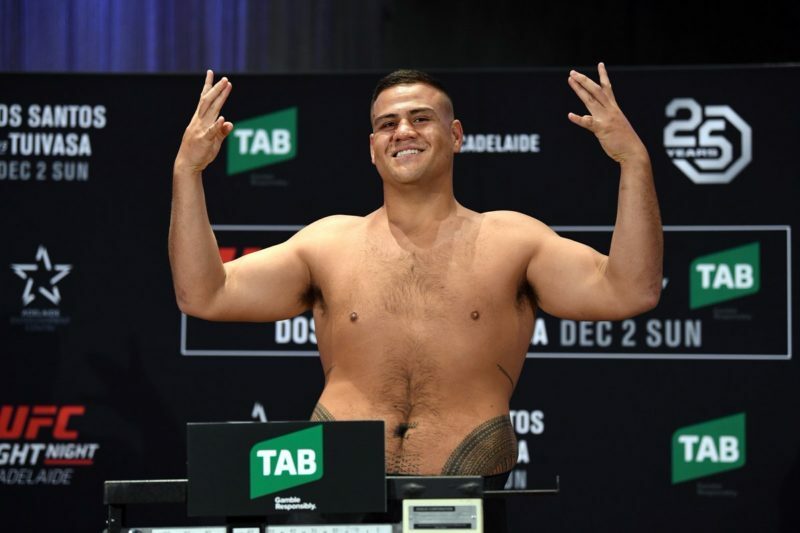 Under Hunt’s tutelage, Tuivasa has been able to gain a wealth of experience, knowledge and a similar fighting style from his fellow, heavy-hitting Aussie. Moreover, his record, thus far, has demonstrated so. Tuivasa’s fight record, or body count if you’d like, is quite impressive. All of his first nine wins came by knockout, and all in the first round. Sure, being heavy-handed is a typical trait of a heavyweight. However, Tuivasa has demonstrated characteristics that are outstanding. The main one is his relaxed, Mark Hunt-esque fighting style. In striking, the ability to be loose is key to hitting harder and from that looseness also comes fluidity. His fight against Asker was a prime example of this. After hurting Asker with a quick elbow counter, Tuivasa showed dynamic and effective striking: mixing up head and body punch combinations, along with bone-crushing elbows. Watching Asker’s head snap around after every landed strike was cringe-worthy and it was remarkable how long he was able to withstand the onslaught. But, we all know how it ended. The other thing to remember about Tuivasa is that he is an athlete. Playing rugby since childhood has shaped his reflexes, hand-eye coordination, and given him an overall understanding of his body and how to utilize it. At first glance, he wouldn’t necessarily ‘wow’ you with his physique, but for a big man, he is explosive, and he can move. His first opponent in the UFC, Rashad Coulter, realized that once it was too late. After he was chopped down by the leg kick, he thought he was going to be able to stand up and find solace against the cage. But Tuivasa shattered that illusion with his freakish athleticism. The fact that a man of his size was able to leap through the air and land a knee on the chin of another man his size is spectacular. That knockout, in fact, is only one of two flying knee knockouts in the heavyweight division. Continuing his streak of knocking dudes dead in the UFC has put Tai Tuivasa in a place where he can break into the top 10. 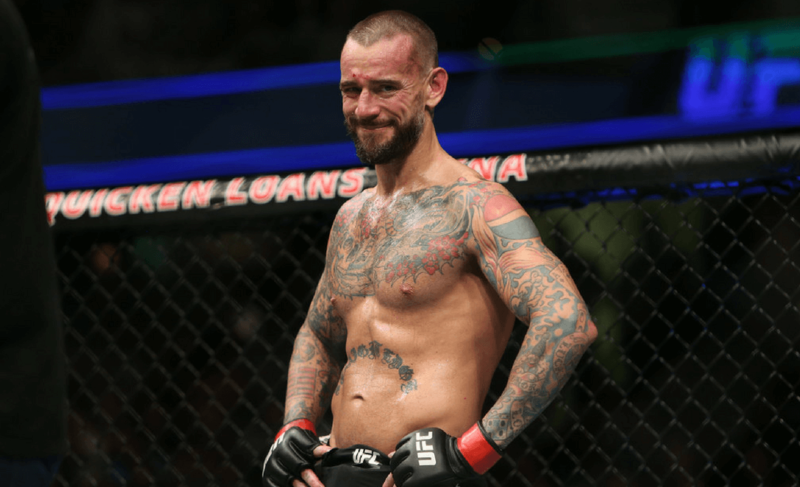 In March, he inked a new four-fight contract and looked to move up in the rankings by asking for a fight with Stefan Struve, a 20-fight UFC veteran with notoriety. However, shortly after his new contract signing, Tuivasa was given an even bigger name and, if victorious, would yield an even greater reward. The bout would take place on June 9 in Chicago on the main card of UFC 225. His opponent – former UFC heavyweight champion and #9 ranked, Andrei “The Pitbull” Arlovski. Many felt that Tuivasa’s history of starching his opponents would continue with Arlovski and with good reason. Arlovski has 43-fights to his name (27-15-1), is closing in on the age of 40, and has 10 KO losses in his fighting career. Leading up to the fight, Arlovski’s weak chin was a big topic of discussion, especially since Tuivasa has KO’d all his prior adversaries. However, Arlovski is a crafty veteran with lots of experience and can never be counted out. And the tough Belarusian pushed Tuivasa to his limits. The first round was a strong one for Tuivasa. 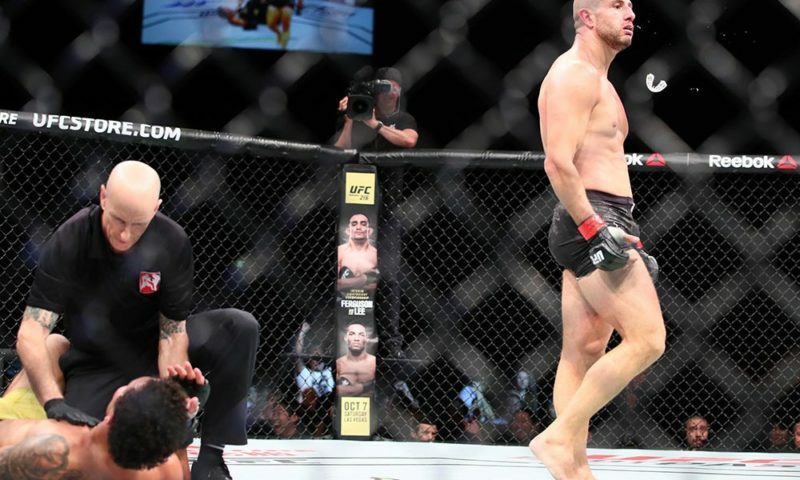 He issued a good number of leg kicks to Arlovski, gained mount position briefly after a poorly executed throw by Arlovski, and ended up landing a strong short left hook on the veteran’s chin that sent him to the mat. Without being able to finish his opponent, Tuivasa was now faced with heading into the second round. Arlovski was able to recover and ended up scoring multiple times with jabs, kicks, and occasional clinch work that negated most of “Bam Bam’s” offense. Bloodied from a cut on the bridge of his nose from one of Arlovski’s strong jabs, Tuivasa still held the center of the cage and attempted to walk Arlovski down. Contrary to what anyone predicted, the fight moved into the third round and, again, uncharted water for Tuivasa. Arlovski continued to move and not be a stationary target for Tuivasa and kept landing his educated jab and counter kicks. 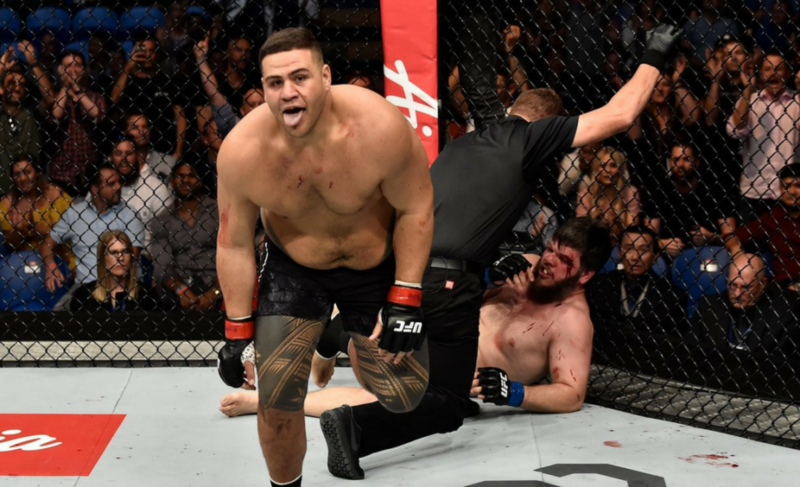 But Tuivasa kept pushing forward – ducking into power shots and looking to put Arlovski away. After three rounds, it was a close fight. The judges awarded Tuivasa the victory with unanimous 29-28 scorecards. At the end of it all, Tuivasa’s performance proved to audiences, and critics alike, two things. 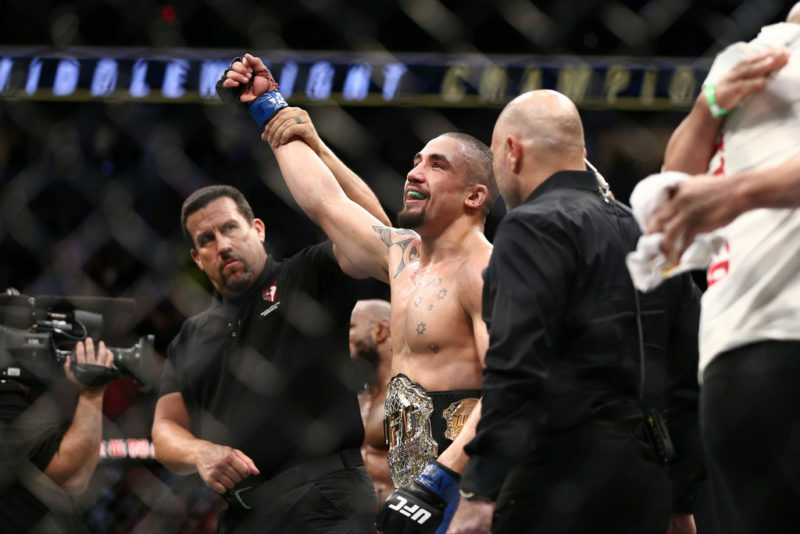 It showed that he is capable of hanging and competing with elite fighters and that he can go all three rounds. At the age of 25, Tuivasa is still a young fighter who has yet to hit his prime, and it’s scary to think about how much better he can get. So with the pride of Australia behind him and in his heart, beating the man from ‘The Area’ will prove to be quite a challenge. Are you a fan of Tai Tuivasa? Leave a comment below and tell us why.